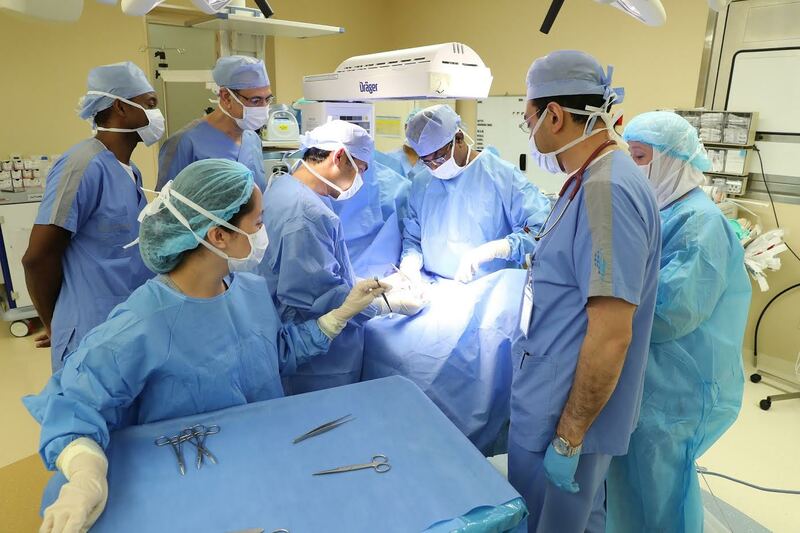 Abu Dhabi: Surgeons in Abu Dhabi saved a newborn with a deformity consisting of small intestine, and the whole liver to extrude outside his trunk, hanging in a huge spherical shape sealed by thin membranous lining at the level of umbilicus. The newborn underwent a major surgery 2 weeks after birth which lasted for five hours and was completed successfully. Danat Al Emarat is a world-class specialty women and children’s hospital located in the Emirate of Abu Dhabi and managed by Singapore ParkwayHealth, a subsidiary of Southeast Asia’s largest private healthcare provider, Parkway Pantai Private Limited. The five-storey hospital covers an area of 45,000 square meters, offering a comprehensive range of inpatient and outpatient medical services, full-fledged Neonatal Intensive Care Unit (NICU) & Pediatric Center, Woman’s Diagnostics & Breast Imaging, Surgery, Obstetrics and Gynecology, Laparoscopy and Minimally Access Surgery and more, all of which are equipped with the latest technology and highly-qualified staff to provide unmatched patient and family-centered care. Adopting top international hospitality standards, Danat Al Emarat provides a full range of VIP suites and services to cater to the Abu Dhabi Community combined with leisure and entertainment for the families and guests. Danat Al Emarat is a flagship hospital of the UEMedical healthcare network, Abu Dhabi’s leading Healthcare Development & Investment Company. The hospital was designed by renowned American architectural firm HKS.